The need for organisations and people that can provide help today and hope for tomorrow to everyone affected by a brain tumor diagnosis has never been greater. 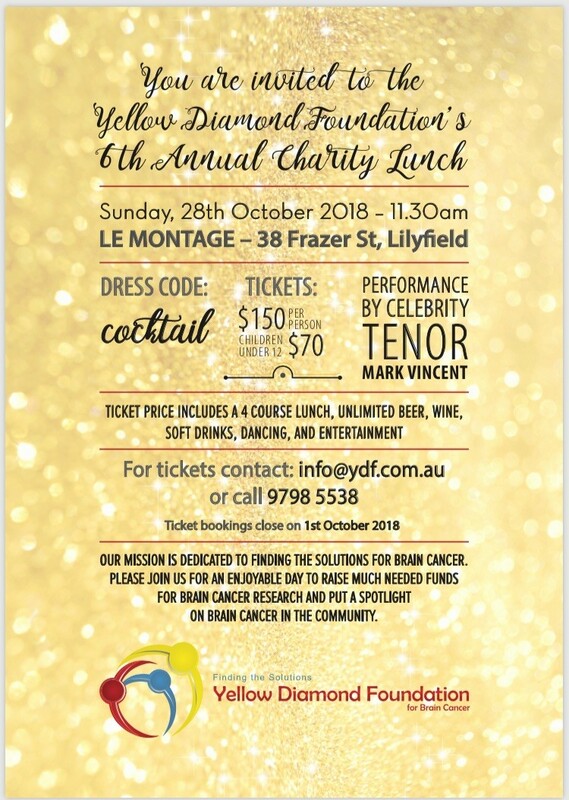 The Yellow Diamond Foundation is an Australia-wide charity that works every day to raise awareness, provide support and fund research to make things better for people affected by this devastating disease. To do this, we need the right people, who share our vision and feel they have the skills and experience needed to achieve the best possible outcome, in every way, for those affected by brain tumors. We’re looking for people and companies with a real enthusiasm for working in the charity/voluntary sector and who are prepared to create fundraising events to benefit the communities of patients, healthcare professionals, and the medical researchers in the task of Finding the Solutions for Brain Cancer. If you are interested in hosting an event on behalf of The Yellow Diamond Foundation, please refer to our Event Application form. Contributions are tax deductible and you or your organisation will be recognised in our marketing material, including our web site (with connections to your own company website if you choose) and in our communication newsletters. Your help will assist us in moving forward in finding the solutions for this dreadful disease. © YELLOW DIAMOND FOUNDATION. ALL RIGHTS RESERVED.